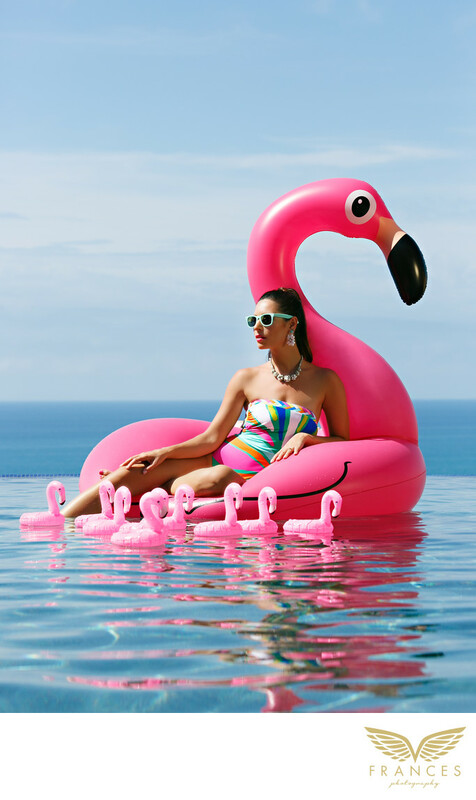 On a clear and beautiful sunny day, a fashion model is relaxing on a giant pink inflatable float shaped like a flamingo. The upper half of her body is lounging on the inflatable float, while her legs dangle into the swimming pool’s crystal blue water. There are eight mini pink flamingos floating by her legs. Her hair is tied back into a slick ponytail and she is wearing bright sunglasses and a sparkly necklace. Her swimsuit is a strapless one-piece with a multi-colored swirl design. She is looking at the side to show off her earrings and her beautiful side profile. She is lounging on a swimming pool overlooking the vast ocean; the different shades of blue captured in the image are very calming and soothing to the eye. The rippling effect of the water contrasted with the pink flamingos results in a very visually striking effect. While she is not looking straight at the camera, you can tell from her side profile that her features are gorgeous and that she is angling her body to highlight her best attributes.